People of all ages gathered Sunday evening for the 52nd annual lighting of the Zilker Holiday Tree. Austin Energy decks out the 155-foot moonlight tower with 39 streamers, each containing 81 bulbs of varying colors. Winners of a children’s art contest sponsored by the Austin Parks and Recreation Department lit the tree. The moonlight tower is one of 17 that remain of the original 31. The Zilker tower was taken down in 2016 to be repaired and refurbished with LED bulbs. 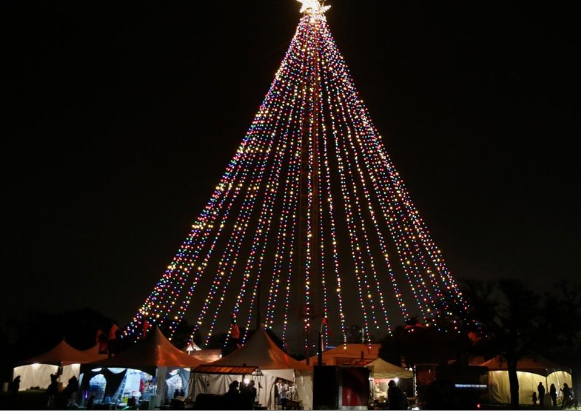 The original Moonlight Tower used for the Zilker Holiday Tree was replaced in 1972 because it was badly rusted, meaning the current tree base has been in use for 45 years. In 1970, the #ZilkerHolidayTree was said to be visible from almost all of the city. In 1967, the Zilker Holiday Tree was a part of the city's Yule Fest and was @AustinCityParks way of saying Happy Holidays to residents. The #ZilkerHolidayTree 1st illuminated the Austin skyline in 1967 and has been lit every year since. It started after a suggestion from Alden Davis, a member of the Parks and Rec board. The tree will be on display from 6 p.m. until midnight every night through January 1.